The city of Ronks stems from Amish roots. For maps, photos, ratings, and tourist information, go to the Ronks day trip planning website . Greenwood to Ronks is an approximately 9-hour flight. You can also drive. In March, daytime highs in Ronks are 47°F, while nighttime lows are 30°F. Finish your sightseeing early on the 21st (Thu) to allow enough time to travel to Philadelphia. Your list of things to see and do now includes Independence Mall, One Liberty Observation Deck, National Constitution Center, and other attractions. There's much more to do: ponder the world of politics at Independence Hall, steep yourself in history at Liberty Bell Center, and admire the landmark architecture of City Hall. For where to stay, more things to do, reviews, and tourist information, refer to the Philadelphia trip itinerary planner . Getting from Ronks to Philadelphia by train takes about 1.5 hours. Other options: drive. In March, daily temperatures in Philadelphia can reach 50°F, while at night they dip to 33°F. Finish your sightseeing early on the 24th (Sun) so you can drive to Hershey. Your day-by-day itinerary now includes Hershey's Chocolate World as well as AACA Museum, Inc..
To see maps, traveler tips, more things to do, and other tourist information, refer to the Hershey trip site . Traveling by car from Philadelphia to Hershey takes 2 hours. Alternatively, you can take a train; or do a combination of train, flight, and taxi. March in Hershey sees daily highs of 49°F and lows of 30°F at night. Finish up your sightseeing early on the 26th (Tue) so you can go by car to Gettysburg. You've now added Gettysburg National Military Park Museum & Visitor Center to your itinerary. 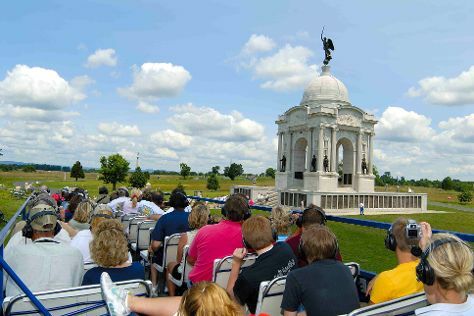 Kick off your visit on the 26th (Tue): get engrossed in the history at Gettysburg Heritage Center, go sightseeing with Gettysburg Battlefield Bus Tours, then stroll the grounds of Gettysburg National Cemetery, and finally take an in-depth tour of Gettysburg National Military Park Museum & Visitor Center. To find photos, other places to visit, maps, and tourist information, read Gettysburg trip tool . Drive from Hershey to Gettysburg in 1.5 hours. Alternatively, you can take a bus. In March in Gettysburg, expect temperatures between 49°F during the day and 31°F at night. Wrap up your sightseeing on the 26th (Tue) early enough to travel back home.